We were asked recently about dealing with insomnia on the road by someone who is interested in RVing but has a history of insomnia while traveling, which impacts the energy available to actually enjoy the places they go. The reader asked if we’ve ever had this issue. I love this question for many reasons: Jason and I both love good sleep; I can definitely relate to having insomnia; and professionally as an occupational therapist, I love the topic of sleep hygiene, as sleep is so essential to all of our other daily activities and to our general livelihood and enjoyment of life. Over the past several years, I’ve struggled intermittently from insomnia, whether or not we’re traveling. The frequency and severity of my insomnia episodes have actually decreased exponentially this year. I think this is due to several factors: I have less daily stress, especially since we aren’t working this year; we spend more time outdoors in natural light and fresh air; we generally have busy, active days with a good bit of exercise built in; and I put less pressure on myself to sleep well because I know our days are mostly flexible (e.g., I don’t have to wake up at a certain time and perform at work all day). When I have suffered from insomnia this year, it’s usually been after long travel days when we’ve spent a lot of time sitting. Occasionally, it’s happened when we’re staying some place strange or noisy (more on dealing with this later), and sometimes, there’s just no explaining insomnia – isn’t that one of the wonderful things about this affliction? But, no matter the reason or severity of my bouts of insomnia, I feel much less stressed about it now. The beauty of flexible travel and generally not having plans that we HAVE to stick to is that I can usually sleep late or take an afternoon nap (or both) if I sleep poorly one night. As an aside, we’re fans of post-lunch family naptime. A short afternoon power nap can do wonders for me, regardless of how I slept the night before. We generally don’t let our daily plans or activities stand in the way of naptime if we really feel like we need it. Naps have happened in many places: on our picnic blanket, on a trailside rock outcropping, in the front seats of the truck (parked in a safe location, of course), or in the RV when we have it in tow – it’s one of the many advantages of a home on wheels. Home: Another huge advantage of a home on wheels (aka an RV) is that we have a consistent and comfortable indoor environment. We aren’t tent-camping or staying in different hotel rooms, rental houses, or guest rooms every few nights. We spend every night in our RV, which now feels like (and is) home. 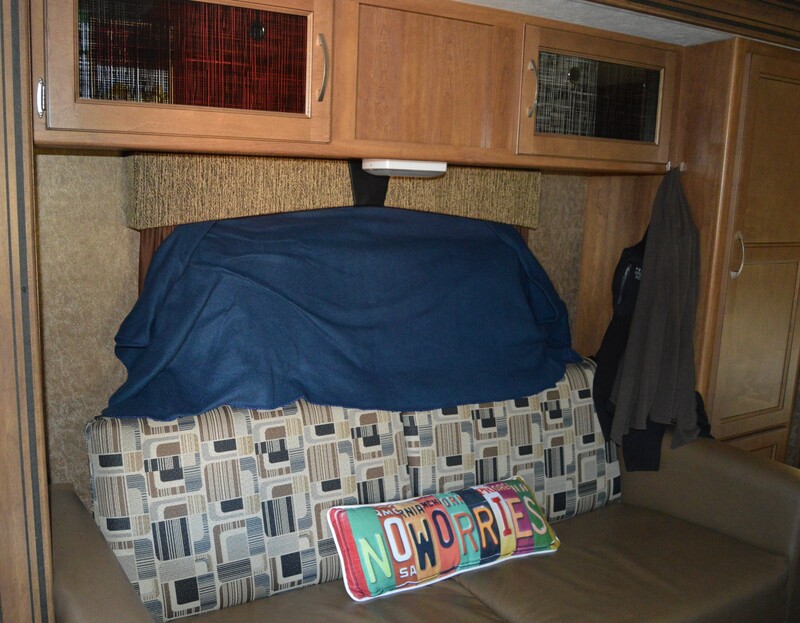 Compared to some full-time RVers, we haven’t done any major decorating or renovation projects, but we have made the space inside our RV ours and have turned it into a homey environment where we feel comfortable and relaxed. Simple things like sofa throw pillows can go a long way toward creating a homey atmosphere. Comfort: A comfortable bed is essential to good sleep. We know RVers who have upgraded their mattresses, a worthwhile investment, especially if you plan to travel for long chunks of time. We decided to buy a memory-foam mattress topper (we bought the same kind we used previously at home, as our old one was worn out and needed to be tossed), which has worked great and allowed us to avoid investing in a whole new mattress. 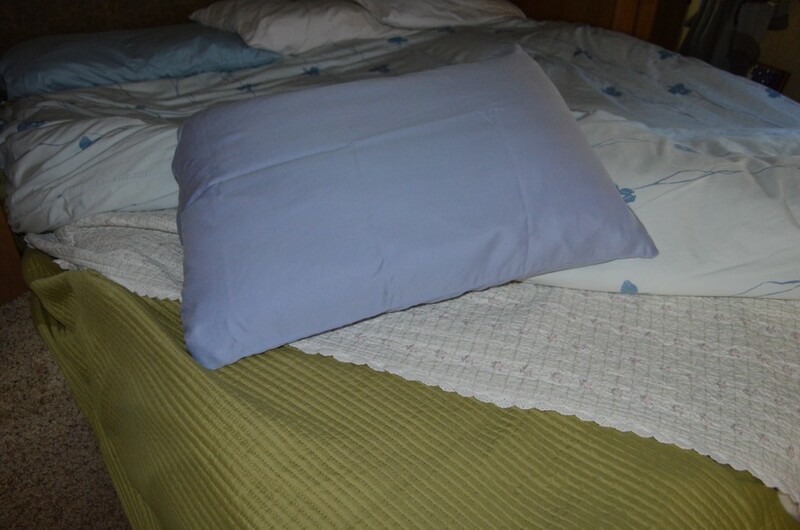 We also use our good (read: favorite) sheets, pillows, and blankets, which are familiar and well-liked. It seemed silly to leave them in storage, and even on shorter weekend trips last fall, we made the effort of using these items in addition to our memory-foam topper from our bed at home (before we bought a duplicate). Yes, I told you we’re high-maintenance sleepers, and it was definitely worth the effort of moving the heavy topper into and out of the RV even for weekends. Sleeping Temperature: We have a variety of blankets and comforters for different nighttime temperatures – everything from a lightweight queen-sized throw to a heavy down comforter. Having the house/RV at a comfortable temperature is essential to good sleep. This is often challenging in the RV, as we’re usually boondocking without hook-ups. When we have hook-ups, we can run the AC, a tabletop fan, and/or our oil space heater. When we’re boondocking, we do the best we can to regulate the temperature by using our roof vent fan or propane heater, which we run only enough to prevent frigid temperatures, as it uses a ton of propane. So, we mostly compensate and create comfortable temperatures by adjusting the amount and types of blankets and clothing that we use at night. We also compensate by adjusting our sleep schedule when needed; for instance, when the RV stayed hot until late at night this summer, we simply went to bed later and slept through part of the cool of the morning and napped in the heat of the afternoon. Light: Another way we’ve always controlled our sleeping environment is by eliminating any obnoxious lights from electronics or appliances. We’ve continued this practice in the RV by covering lights on appliances (e.g., the fridge and carbon monoxide detector) with a small piece of electrical tape. While we have almost complete control over our indoor environment, we obviously can’t control our outdoor environment, which changes constantly. Everything from noise, light (natural and artificial), and overall “feel” is unpredictable and variable. Sometimes we’re stuck in loud campgrounds, noisy truck stops or Wal-Mart parking lots. Sometimes the moon or sun comes in the windows at odd angles. And sometimes a place just feels weird or literally stinks. For all of these possible circumstances, we control everything we can in order to compensate. White Noise and Noise Blockers: Due to tinnitus, Jason has always been a big fan of white noise via a small wind machine. Historically, we’ve taken our wind machine everywhere we go overnight. When we’re plugged into shore power, we use said wind machine; when we’re not, Jason uses a white noise audio track that plays on repeat on his iPod or iPhone. I generally do fine without white noise, and I’m a pretty deep sleeper most of the time. However, when we’re at noisy truck stops or the like, I use foam ear plugs gifted to me last Christmas by my thoughtful and wise sister-in-law. Keep it Dark: Again, a dark sleeping environment is something we’ve always practiced, and it’s become essential on the road, especially when we’re parked overnight in public places or in campgrounds with bright bathhouse lights. 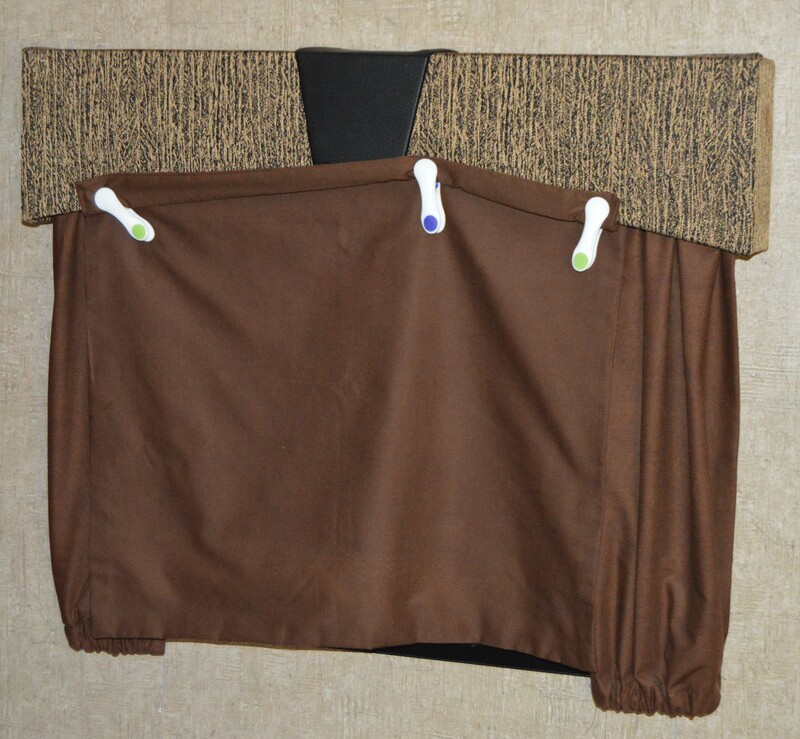 My mom sewed room-darkening curtains for us for the windows beside our bed (we ran out of time to get them installed as planned before we left, but clothespins work quite well when we need the curtains), which have been invaluable. In really bright places, we go to even greater lengths: we cover up the windows above the sofa with our throw pillows and blanket (we call this “building our fort”), we hang a piece of dark clothing over the door, and we sometimes put the sink cover/cutting board in front of the kitchen window. We always keep the bathroom door closed at night to keep out light that comes in from the skylight and roof vent. Create Ambience: Sometimes places just feel weird; I can’t explain it. Or, actually, I can explain it when we’re parked at a truck stop or weird Wal-Mart, but sometimes even nice campgrounds have a strange sort of feeling. I’m definitely more sensitive to this than is Jason. In these places, I do what I can to create a nice indoor ambience. I close the blinds, play music, and sometimes simmer a little water and cinnamon on the stove – this trick also works well when camped in a rural area that smells like chicken manure. 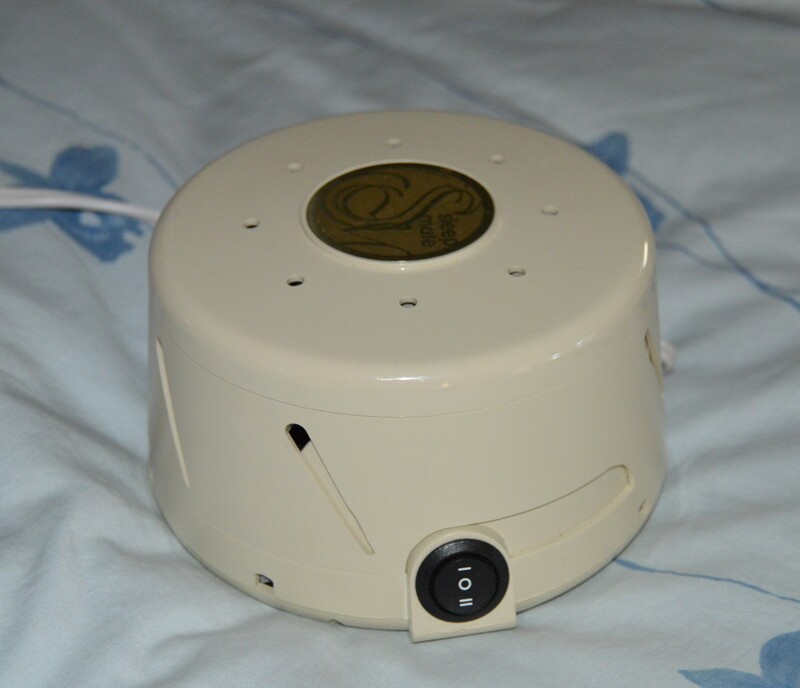 Sleep Hygiene Practices: Keep your bedroom space clutter-free. In our RV, this generally means the entire RV since there is no real defined bedroom; no problem – it doesn’t take long to pick-up a 168 sq. ft. house. Remember that the bed is for sleeping. It’s tempting in a small space to sit on the bed to check e-mail, read during the day, talk on the phone, write, etc., but it can interfere with sleep at night. It’s important for your brain to associate the bed with sleeping and not much else. Avoid caffeine and exercise late in the day. Enough said. Avoid electronics or anything too emotional right before bed (e.g., the news). I make an exception for my Kindle app since we didn’t bring paper books with us, but I do keep the backlight as low as possible. Avoid sleeping in too late or napping too long during the day. A 20-30 minute power nap is usually the perfect amount. Showering/Bathing: We usually shower at night because we’re sweaty and dirty from the day, but showering can also help trigger sleep. The warmth of the water temporarily raises body temperature, which results in the body working to lower its core temperature, which promotes a feeling of sleepiness. Unwind Before Bed: I prefer reading and/or journaling before bed. Journaling isn’t something I practiced regularly before this year but now I understand its benefits. 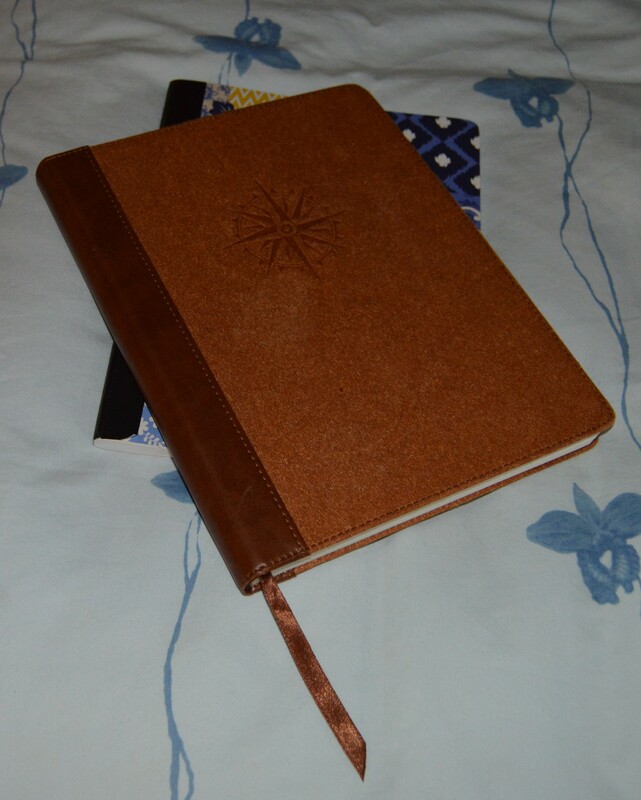 For me, journaling helps me process the day and let go of it. Even just a quick 10-minute session can help tremendously. I don’t write anything profound; it’s usually just a record of our day’s events and our basic reactions. Don’t Risk Hunger: I have naturally low blood sugar, and Jason has a naturally high metabolism. He always has a small bowl of cereal before bed. I often eat some sort of small snack (preferably something with a good amount of protein) before bed depending on our activity level that day, so that I don’t wake up hungry in the middle of the night or super hangry the next morning. Know Your Limits: Even when traveling full-time without jobs or other commitments, staying too busy and overscheduled, especially for too long, can lead to feeling stressed, burned out, and overly tired. For me, this almost always leads to insomnia. Know when to slow down the pace, take travel breaks (e.g., stay in one place for a few days without any expectations for sight-seeing, etc. and have some mandatory R&R and veg time). Are you dreaming of deep sleep now? What tips or tricks do you use to promote better sleep either at home or while traveling? We’d love to hear!